Exposures: Ha,R,G,B 30-40 min combined times each, Lum-50+ min. HaR combined at 25% Ha 75% red. Processing: MaximDL and Photoshop, with deconvolutions in AIP4Win and fits using Registar. 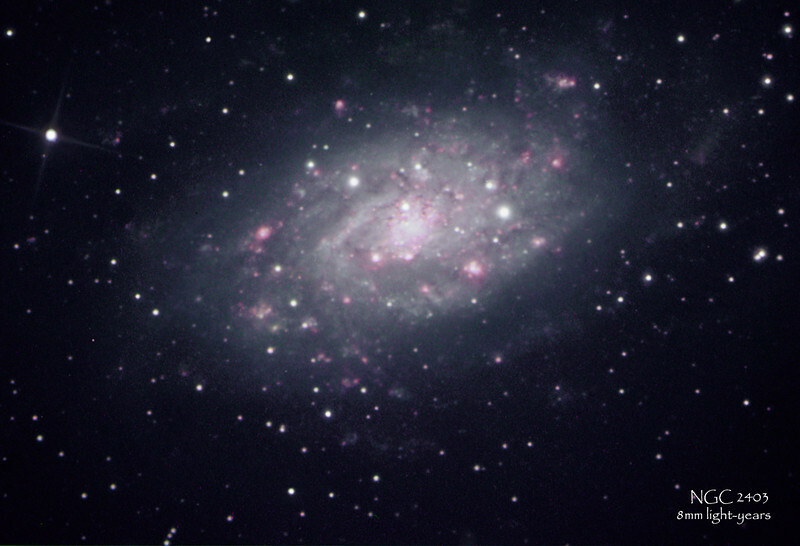 NGC 2403 is an almost face-on intermediate spiral galaxy distanced 8 million light-years away in the constellation Camelopardalis. It is about 50,000 light-years (less than 1/2 of the Milky Way) and has many HII (reddish) star forming regions. There are also bluish Oxygen II faintly visible. This galaxy is relatively low in the northern sky making it more difficult to get detailed pictures. It was originally thought to be only 8,000 light years away.